An accumulation of dirt can make your house’s exterior look dreary. With pressure washing services, Green, Ohio residents like you can increase your property’s curb appeal. This cleaning method can make your walls, driveway, fencing, or walkway look bright and attractive again. It may be tempting to go the DIY route rather than hiring a company that does pressure washing services in Green, OH, thinking it will save you money. However, you may end up paying more. First, you will spend hundreds of dollars on a pressure washer as well as its maintenance. When you hire an expert in pressure washing services in Green, OH, you don’t have to purchase something you won’t use often. Apart from paying a hefty price, you need to research about the chemicals. A company that does pressure washing services in Green, OH knows which products and equipment to use for your property. Lastly, you need to test everything to make sure the exterior surfaces of your home won’t get damaged in the process. With companies such as Wilhelm Power Washing, you no longer have to worry about the chemicals or the equipment you have to use for cleaning stubborn stains. All you have to do is let us perform pressure washing services in Green, OH. Companies that offer pressure washing services in Green, Ohio use special soaps, bleaches, and other solutions to get the best results. If you go the do-it-yourself route, you become exposed to chemicals used for pressure washing services in Green, OH. Individuals who are inexperienced in the job won’t be able to tell the difference between environment-friendly substances and harmful chemicals. To be on the safe side, leave the job to companies that offer pressure washing services in Green, OH such as Wilhelm Power Washing. 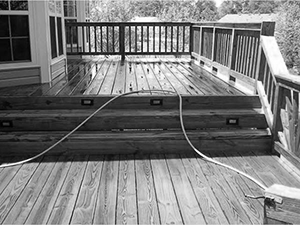 We thoroughly clean decks, fences, driveways, garage floors, sidings, wall, patios, and roofs. Apart from pressure washing services in Green, OH, we offer exterior and interior painting services for various types of properties. In some cases, you may have to work on hard-to-reach areas of your house, such as the roof. Being in a high place and using the washer can put you at risk of getting injured. Seek help from professionals who specialize in pressure washing services in Green, Ohio. These experts have years of experience working on slippery surfaces and in high locations. They also use protective appliances to ensure safety while they perform pressure washing services in Green, OH. The equipment used for pressure washing in Green, OH can slice through wood by simply using water. Imagine what damage it can do to your windows if used incorrectly. Pressure washing services in Green, OH can lead to broken windows or have exterior paint get stripped of if not done correctly. To prevent damage to your property, choose a provider of pressure washing services in Green, OH that trains its workers. At Wilhelm Power Washing, we employ highly trained professionals to provide pressure washing services in Green, OH. They pay close attention to detail and ensure high-quality work on every project they take on, including providing pressure washing services to Green, Ohio residents. At Wilhelm Power Washing, we specialize in pressure washing services in Green, Ohio. To ask for estimates on our pressure washing services, Green, OH residents may call us at 330-477-7094. You may also text us at 330-323-7466 or email us at dwilh51183@yahoo.com to learn more about what we do or schedule an appointment for pressure washing services in Green, OH. Since 1973, Wilhelm Power Washing has been providing expert pressure washing and house painting services to both residential and commercial clients in Northeast OH Our dedicated staff has more than 40 years of combined experience. At Wilhelm Power Washing, we specialize in pressure washing and house painting. When you hire us for your commercial or residential project, you’ll be glad to find that our experts pay great attention to detail. Our professional team does our best to ensure that you get a quality job every time. With professional power washing, all the dirt and grime on your commercial or residential property will be washed away. Using high pressure and water blasts, heat, and soap, we can make your home look brand new. We don’t use just any soap, either; we utilize a safe, environmentally friendly, and biodegradable cleaning solution that not only removes stubborn stains but also keeps mold from returning! Since we use first-rate Sherwin Williams paints on most of our house painting jobs, you can be sure that your home will be as bright and colorful as it used to be. Our professional team guarantees that you won’t see any streaks or uneven layers if we’re on the job.